Jessica Sennett is a cheesemonger who has created the Cheese Grotto. 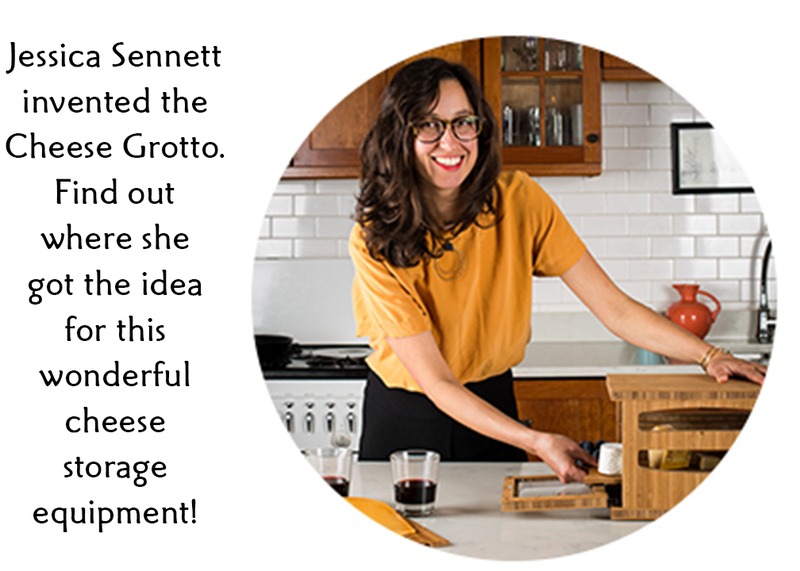 While Fromagination offers a special on any purchase of the Cheese Grotto during the month of May, we also want to let Jessica tell the story of how she devised this special humidor for your kitchen, refrigerator or dining table. The origins of the design come from European Cheese Safes, which are boxes made of wood and screen panels. This was a cheese storage method used before the advent of refrigeration. My design is an elevated version of this. I found that the original cheese safes have a tendency to dry out the cheeses due to too much air flow. So I wanted to design something more highly functional as both an entertaining piece and a functional piece. Hence my added humidity, condensation, and air flow controls, and the use of glass paneling for visual effect. Why are the manufacturers in Virginia? Manufacturing in the States is a challenge, but I was set on doing it. The benefits are that you can make small quantities of product, and you have more say on the quality of what is being produced. In an ideal world, our food and our home products would be made regionally. Eco Supply Center, located in Richmond, Virginia, are very passionate about the Grotto and do an excellent job. They also sell and source all sustainable materials for their projects. The Grotto is made out of sustainable bamboo ply, which makes me even more proud to sell it. The Cheese Grotto has been a long journey of almost 3 years of work, and it has been filled with many adventures. I would say some of my favorite times have been working with the manufacturer. Here’s a story on my blog about my visit in January. What’s the key to maintain the Grotto in top shape? I often tell people to treat the Grotto like you’d treat a cast iron: wash it with hot water and a splash of distilled white vinegar or soap, and treat it with mineral oil ideally once a month. It is a very sturdy piece designed to last a lifetime. Why is it called a “grotto”? A grotto is another word for a natural cheese cave, but it is also a word used for a religious shrine found in nature or in a garden. I call the Grotto my “shrine to cheese,” so it is really quite fitting.